On December 2, 1861, the 79th Pennsylvania assembled on parade to hear an address by commissioners sent by Pennsylvania Governor Andrew Curtin to promote something known as the "Allotment Roll." It looks like company commanders made arrangements with private bankers in Lancaster to offer the option of allowing soldiers' families to receive money directly in Lancaster. The financial plight of soldiers' families had attracted much attention locally, and I'll try to address interesting aspects of Lancaster's implementation of the state-mandated "Relief Fund" in a future post. 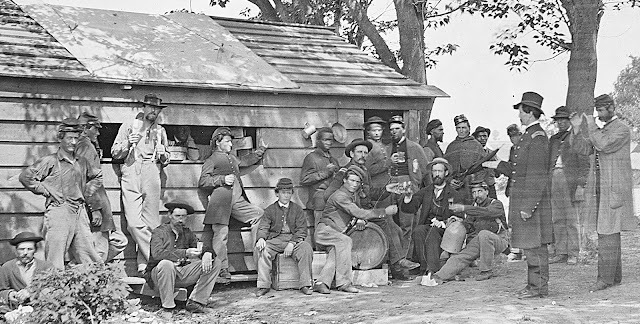 It was hoped, though, that the U.S. Paymaster was finally fully operational in late 1861 and that the flow of money home from soldiers would alleviate the suffering of their families and the burden on local government coffers. The allotment roll was meant to improve upon the decentralized process in the 79th Pennsylvania's first pay day in mid-November when each Captain made his own arrangements for sending its share of the estimated $14,000 in cash that soldiers of the 79th Pennsylvania sent back to Lancaster. [LEH].